Soto Zen could be summed up as a comprehensive practice of cultivating mindful awareness in every aspect of our lives based on zazen, or sitting meditation. Below are the components of our practice at Mountain Rain Zen. Sitting meditation in Mountain Rain's zendo in Vancouver, B.C. Sitting meditation (zazen) is the foundation of our practice. The core practice in Soto Zen is shikantaza, or “just sitting.” Grounded in awareness of the breath and the body, we sit with a spacious, non-judgemental awareness of the arising and passing of sensations, perceptions, thoughts and emotions. We extend this practice of awareness from stillness into motion in walking meditation (kinhin). Usually in the zendo we do very slow walking meditation, but at longer retreats we also do faster walking meditation and outdoor walking meditation. While Zen emphasizes direct experience, dharma study in community can support our practice and deepen our understanding. 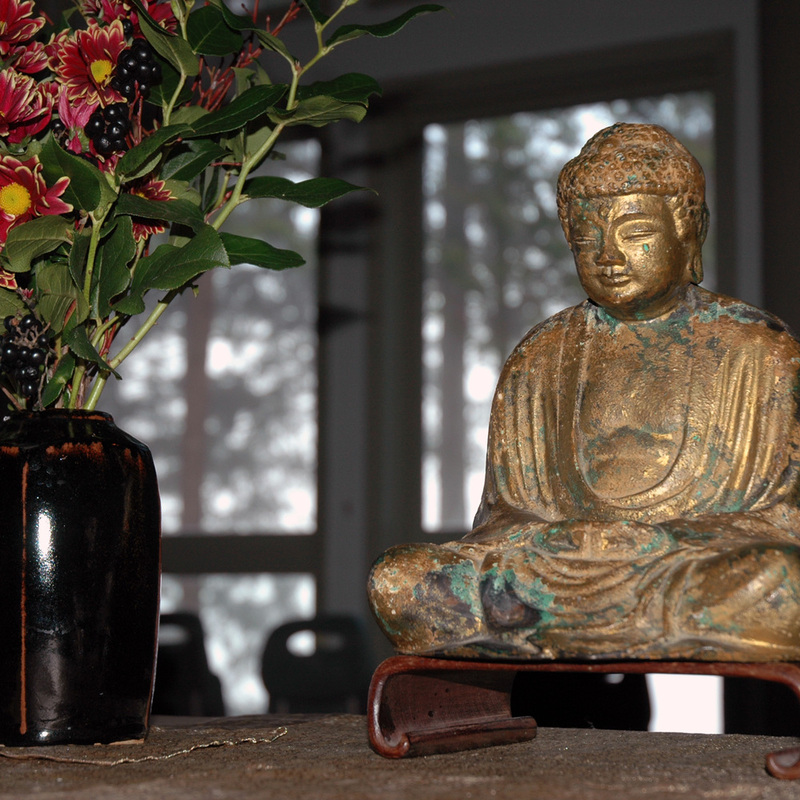 Mountain Rain offers dharma study in the form of evening classes, day retreats and weekend retreats. Dharma study may focus on a traditional text or contemporary teaching. It may include reading, talks by teachers, small and large group discussion and writing exercises. When you participate in Mountain Rain meditation sessions and retreats you are invited to meet individually with our teachers to discuss your practice. Meeting another person and expressing yourself authentically is a practice in itself. Dokusan is a meeting with a fully qualified Zen teacher and Practice Discussion is a less formal meeting with a practice leader. Doksusan is offered at most weekly meditation sessions and retreats. For centuries work has been an important part of Zen practice. Working in silence, mindful of our body, our tools, our surroundings we strengthen our capacity to give our full attention to one task — and enjoy it! We can practice mindfulness in action at the zendo and in our daily lives. Work practice at Mountain Rain includes zendo practice positions such as tenken (timekeeper), kokyo (chant leader), doan (bell ringer), jisha (teacher’s attendant), or ino (head of zendo ), as well as making tea, cleaning, cooking, making posters, etc. Our community depends on the contributions of many! At our retreats and some of our weekly meditation sessions we do a service in which we chant traditional Buddhist and Zen texts, mostly in English translation, and some in Sino-Japanese. On some occasions we include non-traditional chants as well. In chanting we practice with our breath and voices, and in bowing we practice with our bodies. Ceremony is another way of practicing in community that supports us to let go of our habitual thinking, and to affirm our deepest intentions for lives. At Mountain Rain we hold various celebrations and ceremonies throughout the year including Buddha’s birthday, death and enlightenment days. At least once a month we have a service dedicated to the well-being of those who are ill and the peaceful transition of those who have died. Ceremonies are ways to mark important life transitions in community with family and friends. Life transitions include beginnings and endings: birth, coming of age, graduation, marriage, moving to, a new home, leaving an old home, ending a relationship, death. Mountain Rain offers guidance in creating a meaningful ceremony that incorporates elements of the dharma, and of our practice. They are available to help you plan Life Transition Ceremonies, and to officiate or lead them as appropriate. Sangha is one of the “Three Treasures”: Buddha, Dharma and Sangha — teacher, teachings and community. In early Buddhism the word sangha referred to ordained monks and nuns, but in contemporary practice it refers to the community of people who practice together. Sangha means relationships, and that is how we actualize our practice — in relationship. Though some of our members have received priest ordination, Mountain Rain is primarily a lay practice community. We encourage making family, work and social service/activism part of our practice. We use traditional monastic forms to create a container of support for our practice. Our sangha includes everyone from the “regulars” to those who participate when they are able on an occasional basis. It extends to our sister Soto Zen sanghas in the Pacific Northwest, to local sanghas from other practice traditions in the Vancouver area, some of which share our zendo, and help us with the rent. Ultimately sangha includes all beings. Right Conduct is an important part of the Eightfold Path taught by the Buddha. In our tradition the Sixteen Bodhisattva Precepts serve as guidelines to ethical conduct in our everyday lives. They are inexhaustible as mindfulness practices and as deep points of inquiry into the true nature of being. At Mountain Rain we do a bodhisattva precepts ceremony once a month on the full moon, following a tradition that dates back to the time of the Buddha. We chant the precepts together and reflect on our practice of right conduct in the past month. Members who have established a strong commitment to practice may ask to receive the precepts in a formal ceremony called jukai, lay ordination. In preparation they study the precepts and hand-sew a rakusu, or small bib-like monk’s robe worn on a strap around the neck. For more information of jukai and precepts study please click the first link below, and for the text of the bodhisattva precepts please click the second link. Engaged Buddhist practice is the way we extend out practice into the wider community, through social and environmental activism and service. We put our bodhisattva vow to benefit all beings into action, grounded in our practice of mindful awareness, wisdom and compassion. Please see our Events listings for current Engaged Buddhist activities.